Watch, Play, WIN $100 Cash! 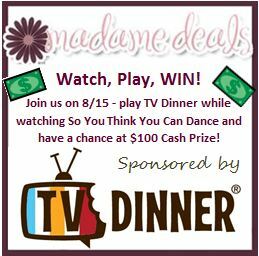 Join us on 8/15 to play TV Dinner while watching So You Think You Can Dance. You will have a chance to win a $100 Cash Prize! With the TV Dinner app you can get together with other fans, friends or family and chat while watching your favorite TV shows. There’s other shows too besides SYTYCD…lots of fun to be had! You no longer have to have an iPad to play along with the TV Dinner app! It is now available ONLINE! So, you can be chatting on your iPad with friends while they’re online chatting to you! It’s a great way to discuss your favorite shows while they’re happening instead of after! Make sure to tell them that Giveaway Bandit sent you!